Can you imagine celebrating the holiday season without Christmas lights? In North America, it is expected that festive strings will illuminate trees, homes, and city centers throughout the month of December. But the Christmas lights we have today have been a long time coming. Its evolution began in 18th century Germany and continues to progress each year. It is said that Christmas trees were reserved for wealthy citizens of Germany in the 1700s. Those with exorbitant amounts of money would lavish their trees with candles – an expensive and hazardous decoration. Some time after Thomas Edison invented the light bulb, he strung together a series of electric lights. In 1880, during the holiday season, he hung the strand outside his laboratory near a railroad line. Those traveling by train could see the first illuminated Christmas display. Shortly after Edison began stringing lights together, a partner of his, Edward H. Johnson, wound a strand around his Christmas tree. He also colored the electric bulbs red, white, and blue. Still, Christmas lights were reserved for wealthy families. It is estimated that lighting a Christmas tree in 1903 would have “cost $2000 in today’s dollars”. This prompted General Electric to offer Christmas light kits that contained strings of colorful lights. In 1917, making Christmas lights common and accessible was a priority for the Sadacca family. They owned a novelty lighting company and began offering colorful stands of Christmas lights at their store. They became known as NOMA Electric Co., a popular name in Christmas lights that dominated the market for over four decades. Today, Christmas Lights come in all shapes and sizes. People in North America, and throughout the world, choose to don their homes with festive lights. Now a days, it seems the holiday season officially begins when houses are aglow. Millions of Americans celebrate Christmas, Hanukah, Kwanza and other holidays with creative lighting. They take holiday decorations to a new level, becoming inventive with one of the world’s greatest inventions. 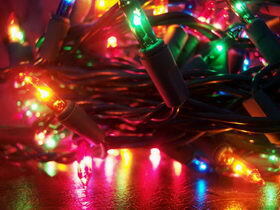 This entry was posted in Christmas, Christmas Decorations, Christmas lights, Christmas Tree, Colors in holidays, holiday, Holiday art, holiday spirit, holidays and tagged Christmas, Christmas Light, Christmas tree, Electric light, General Electric, Germany, happy holidays, holiday lights, Thomas Edison on December 16, 2013 by segmation. Christmas is a holiday that is special to hundreds of thousands of individuals around the world. This holiday is celebrated in many different countries with numerous traditions. Time with family, gifts under the Christmas tree, and contemplation of the important things in life are hallmarks of this wonderful time of year. What is your favorite aspect of Christmas? Normal Rockwell was born in New York City on February 3, 1894. He was a student at the New York School of Art. Interestingly, Rockwell’s first commissioned art was for Christmas cards when he was only 15 years old. The Christmas card art was just the beginning of the American artist’s journey into holiday themed artwork. An issue of the Saturday Evening Post that was released on December 25, 1948, featured one of Norman Rockwell’s famed Christmas pictures known as “Christmas Homecoming”. The image displays over a dozen individuals standing in front of a Christmas tree; two of the people in the image are embracing enthusiastically. While there are “minimal references to Christmas” in this picture, the season is still somehow clearly represented. Another of Rockwell’s Christmas themed pieces of art is titled “Stockbridge Main Street at Christmas”. The oilpainting was finished in 1967, 10 years after it was begun. It was painted for McCall’s magazine and displays a quaint, picturesque street that is lined by snow-covered automobiles, a church, and other buildings. This image is just another example of the amazing way Norman Rockwell captured the Christmas holiday in his artwork. Make this Christmas season more memorable by creating your own seasonally themed works of art. Segmation offers a SegPlayPC Christmas pattern “paint-by-numbers” collection that makes it easy and fast to uniquely celebrate your favorite time of year. Learn more about Segmation’s Christmas pattern collection by visiting http://www.segmation.com/products_pc_patternsets.asp#CHR. Coming soon: Thinking about re-painting the exterior of your home? If so, you won’t want to miss our next post! This entry was posted in American art, Artists, Christmas, holidays, Norman Rockwell and tagged american, Art, artist, arts, artwork, Christmas, Holiday, illustration, inspired, Norman Rockwell, seasonal on December 17, 2012 by segmation. Do you recall your favorite childhood pastime? For many people, art making was perhaps their most loved activity. Some individuals have fond memories of drawing, molding play dough, and finger painting. More specifically, creating amazing paintings using paint by number kits ranks high on the list of favorite childhood activities for scores of people. Are you one of those individuals who has cherished memories of paint by number? Amy, a woman from Indianapolis, holds her paint by number recollections close to her heart. She remembers growing up admiring two paintings of beautiful women that were displayed in her bedroom. “I remember staring at them so often and dreaming about their lives,” Amy commented. When she was older, Amy discovered that her mother had painted those pictures using paint by number kits. Though she was not as talented at paint by number as her mother, Amy still treasured those paintings that brought joy and life to her imagination. Audrey, an individual who grew up in a farmhouse in Minnesota, recalls sitting at her kitchen table while painting ballerinas as a child. Audrey admitted that she is not necessarily an artist, but said that paint by number gave her the opportunity to become one. Her experience with paint by number was unforgettable as it allowed her to “escape into the world” of the ballerinas she painted. Audrey is grateful to have these priceless memories. How much do you enjoy paint by number and Segmation? Whether you love being a perfect painter, great digital artist, or have fond childhood memories of coloring inside the lines, your experience is unique. We want to hear your story in the comment section below. What does paint by number mean to you? Coming soon: Read Segmation’s exciting article on how to easily make your own paint by number pillow. You won’t want to miss it! This entry was posted in "out of the box" art, Art, Art Blog, Artists, childhood memories, Christmas, color wheel, Cyber, Cyber Monday, Cyber Tuesday, paint by number, Paint by Number kits, unique art forms, unlikely artist and tagged Art Blog, cherished, childhood, Christmas, color wheel, Cyber, Cyber Monday, Cyber Tuesday, Impressionist paintings, memories, number, Paint, Paint by Number, paintings, Segmation, SegPlayPC, stories on November 23, 2012 by segmation.